More often than not, I have wished for a quick getaway. By that I mean a vacation-like ambiance, a lazy lunch, something away from the maddening crowd – and a different cuisine. Situated in the Quayside Isle of Sentosa, Mykonos on the Bay provides a perfect combination of sunny weather and exotic waterfront view along with Greek cuisine. Quayside Isle is the new area which has opened up in Sentosa Cove and is filled with restaurants serving different cuisines. This area is situated diagonally opposite to the W hotel in case you need to explain to cab driver. When I reached the place, I noticed that it had an immediate Greek appeal – the white and blue themed cutlery, models of ships and a taverna feel. We opted for outdoor seating as we wanted to enjoy the breeze along with the view. In case if it gets too sunny, the serving staff are very kind in shifting the table to the shaded part of the restaurant. The menu was extremely interesting with clear description on the offerings and there were quite a few vegetarian options. It was a bit pricey, but that is expected in Sentosa and the location in which the restaurant is situated. 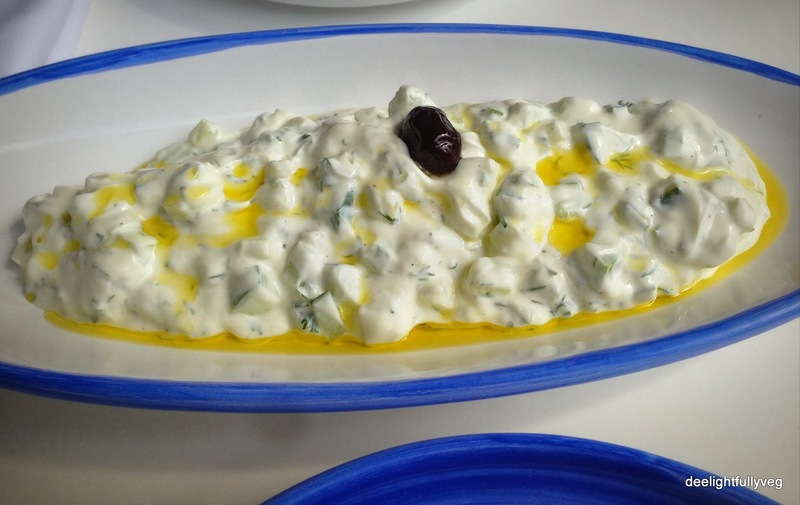 We straight away went for the ‘Tzatziki’. It was crunchy and had the right balance of cucumber, Greek yoghurt and olives and we gobbled this up in no time. 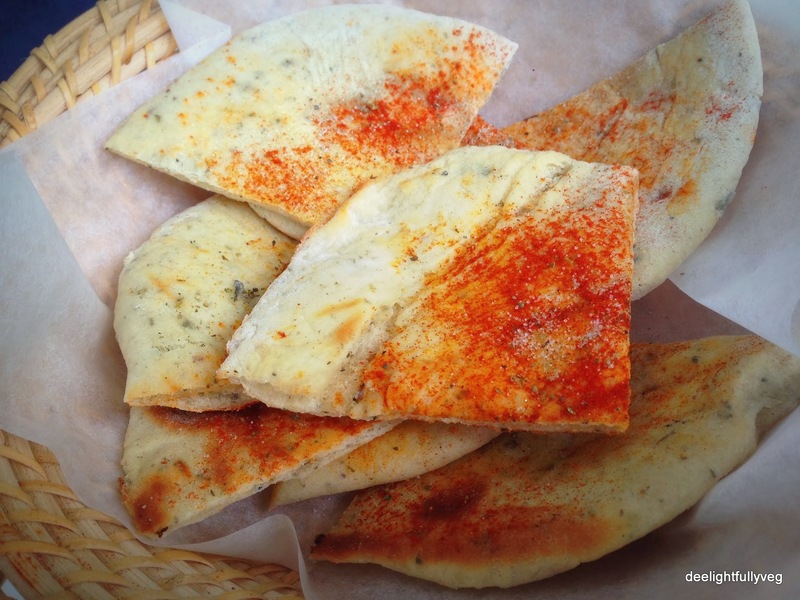 As a dip base, we ordered the ‘Warm Pita bread basket’ which went very nicely with the Tzatziki. The bread was well seasoned and spiced to act as the hot ingredient for the cool cucumber dip. 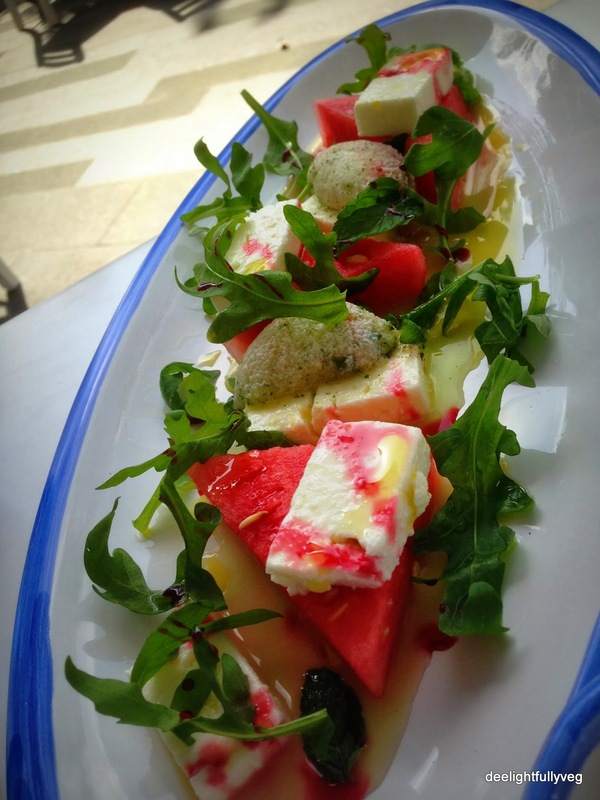 To beat the humid weather, I decided to go for the ‘Feta cheese and watermelon salad’ which was refreshing to the core. The watermelon had just the right sweet taste and the feta cheese along with mint leaves elevated it to the next level. I enjoyed every bite of this salad and it added to the chilled out mood. When a dish is clearly explained on the menu, it becomes easy to order as one can visualize the blending of flavors. 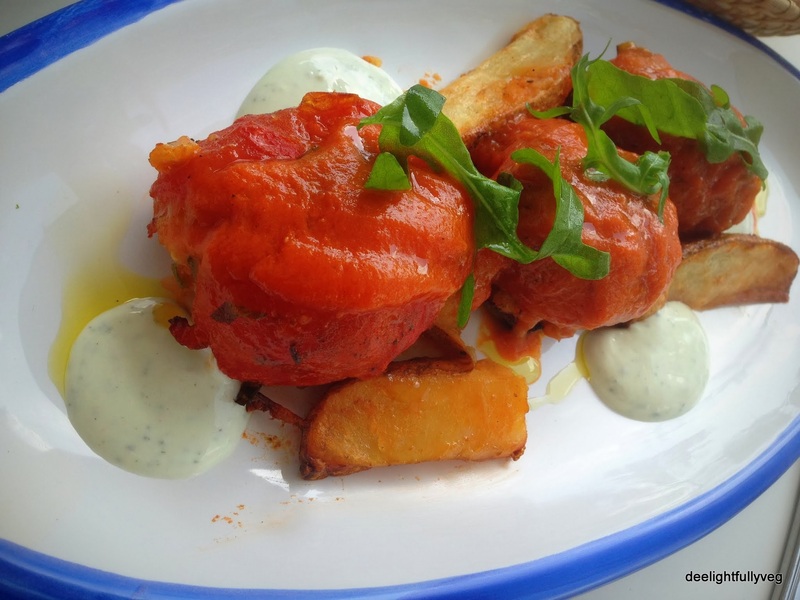 Next we went for the ‘Gemista’ which was quite interesting to eat as it had Roma tomatoes stuffed with rice and herbs along with yoghurt mint sauce and fries. I had not tried rice stuffing inside a vegetable before and it’s something I definitely plan to try now! When the best is saved for the last in the form of desserts, you know it ends up in being a fulfilling meal. We decided to skip the traditional Baklava and ordered the ‘Pagoto Giaoyrti’ which was just awesome. 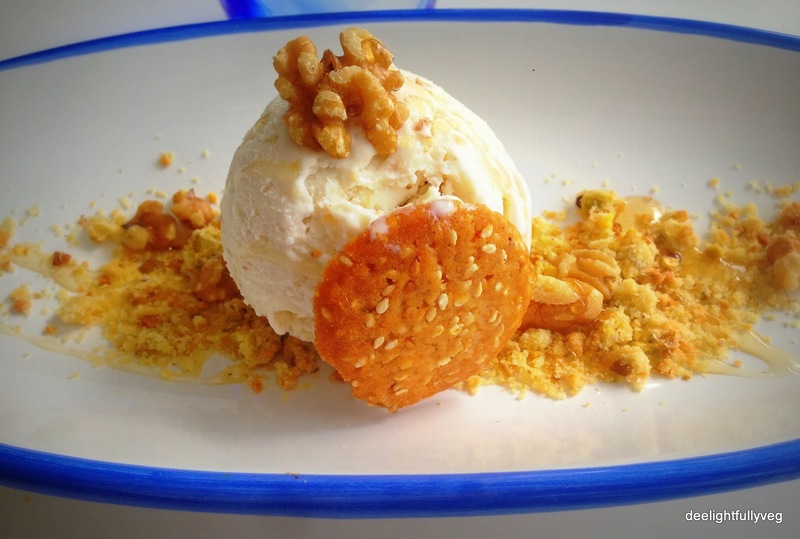 This was a home-made Greek yoghurt ice cream with acacia honey and walnuts along with a sesame crunchy biscuit. This was a befitting end to the meal. 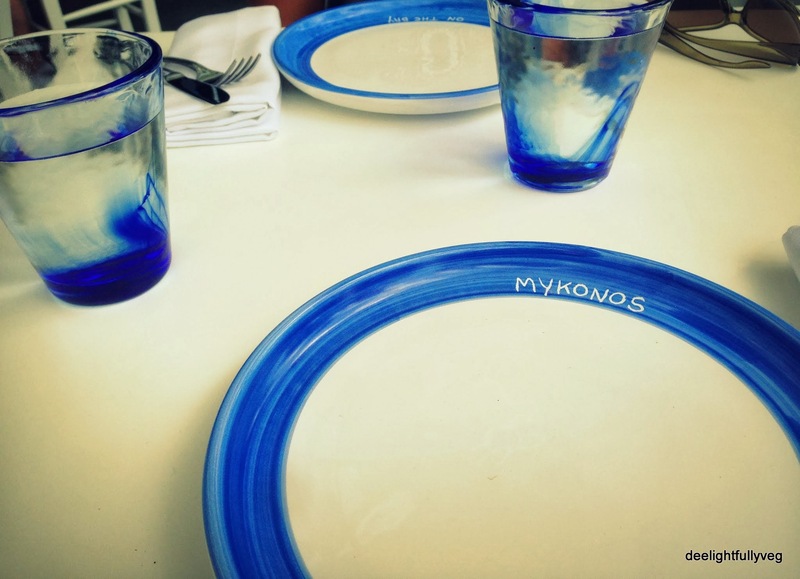 If you are looking for a getaway, a different cuisine experience, a menu with sufficient vegetarian options, friendly service, an inauguration of your new shades, or a relaxed ambiance for a special occasion then Mykonos on the bay is totally worth a visit. Whether I will go back all the way just for the food I don’t know but it will remain a memorable experience on the whole and I might drop by for the baklava next time I am in Sentosa.